Krunal Pandya recently made his debut in the T20I series against Windies. The left-hander had a tremendous start as he impressed with both bat and bowl. As a result, he retained his place in the side for the T20I series in Australia. But the 27-year-old witnessed the brutality of the game as soon as he set his foot on Australian soil. He conceded 55 runs from his 4 overs in the first game at the Gabba, Brisbane. Glenn Maxwell slammed him for 3 consecutive sixes. The spinner failed to pick up any wicket and had an awful day with the bat as well. It was a reality check for the young man who realized how difficult life can be in international cricket. But Krunal made a tremendous comeback in the next 2 games. In the rain-affected game at MCG, Melbourne, he bagged figures of 26/1 from 4 overs. He made it even better in Sydney by returning with figures of 36/4 in the last game. Those turned out to be the best figures by a spinner in Australia in the shortest format of the game. India leveled the series and Krunal won the Man of the Match award. The left-hander reflected on the Brisbane pounding and mentioned it wasn’t easy to regain confidence. He also praised the contribution of Kuldeep Yadav in helping him to a four-wicket haul. Additionally, the Baroda-lad hailed the match-winning knock played by the captain Virat Kohli that helped India chase down a tricky total. “It was very difficult for me in the next 24 hours to convince myself. This was just my second series and my first time in Australia. They hammered me in my four overs for 53 . To come out of that, it was not easy to be honest. 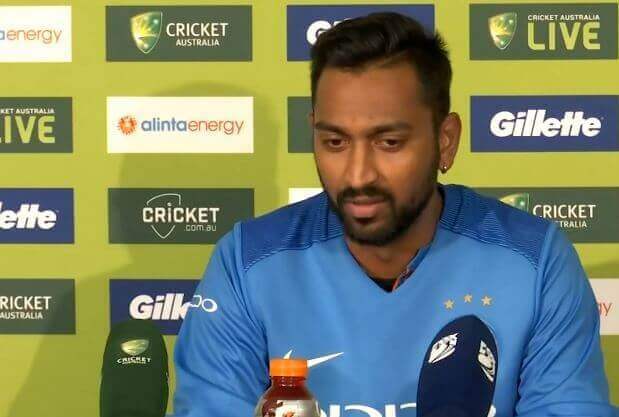 It took me a while, I had to back myself much more,” said Krunal Pandya in the post-match conference. “When you give 53  runs, having hardly played games at this level, to come out of that I was really happy. Those kind of hurdles, when you overcome that you feel really good about it. As a bowler and as a player you have to understand that this is T20 format and it’s part and parcel – one day you’ll get hit, one day you’ll pick up wickets. I’m happy the way I made my comeback and just want to continue this,” added Krunal. “Obviously it went slightly tricky (in the latter part of the match). Initially, with the way we started we didn’t think that it will go this close,” said Krunal. “In the end, when Virat is there, he’s done this a number of times. So we had the belief. Plus Dinesh was also there and I was also there, there were other batsmen as well. The belief was always there but having Virat in the middle is something different,” added Krunal Pandya.